Located in Cortona's prestigious Pergo area, this is a stylish property in an absolutely enchanting setting. The property is accessed via a gated and olive lined driveway which leads into a charming circular 'piazzale'. The property consists of two buildings which stand in grounds of one and a half acres surrounded by gentle hills filled with olive trees. To the West Cortona sits majestically on its hillside which one can look at until the sun has gone from the horizon. It is a classically beautiful property in one of the prettiest contexts seen to date. Just a stroll away there is the beautiful hotel/restaurant Villa Piazzano which caters for both lunches and dinners. Also within walking distance are the villages of Pergo and Montanare. In Montanare there is an excellent restaurant, Il Mollino, owned by the Baracchi family who also own the famous Il Falconiere restaurant/hotel and who produce fine wines under the Baracchi label. In Pergo there is the Relais and restaurant Corte dei Papi, a well frequented bar with outside seating which has an eclectic mix of both resident foreigners and Italians, a pizzeria and very well stocked delicatessen/mini-supermarket. The main house is elegant both inside and out. It consists, on the ground floor, of a large dining area/sitting room with original fireplace, a recently fitted kitchen, a pantry/laundry room and a wonderfully sunny breakfast room (or study) with arched windows, off which there is a new bathroom. All of the ground floor rooms lead outside to the garden. The first floor consists of a lovely large landing which leads out under a covered loggia, a winter sitting room (or second bedroom), a master bedroom with en suite bathroom and a large, third bedroom which is currently used as a dressing room. The en suite bathroom has under floor heating. There would be no difficulty with creating a second bathroom on this floor. The adjacent tower, built on three floors, has been converted into a two bedroom apartment with bathroom and kitchen. 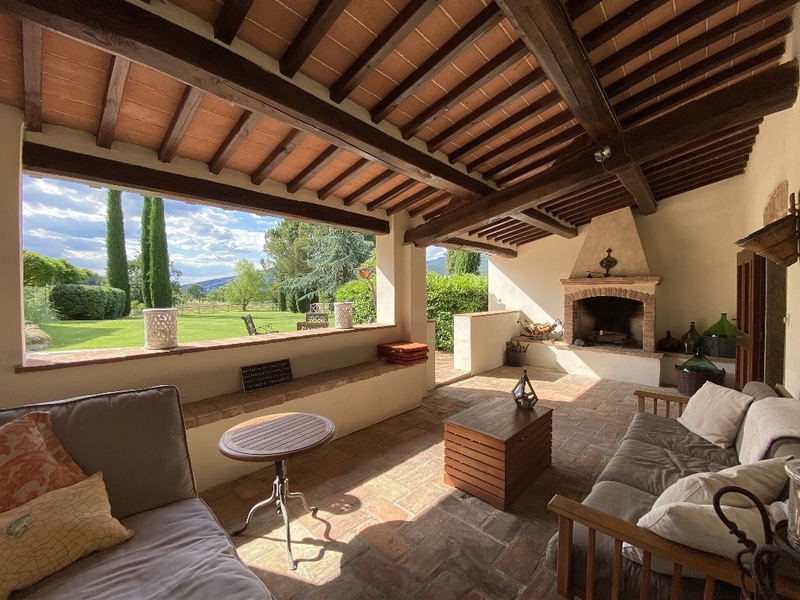 The ground floor consists of a large covered loggia with a beautifully hand crafted stone fireplace/barbecue designed for use during both the summer and winter months. A large room to the back of the loggia has been converted into a charming dining area. There is also a useful store room for garden tools and a technical room for the recently installed new gas boiler. The current owners have created attractive and spacious internal spaces throughout the main house which they tend to use just for themselves. The ex-tobacco drying tower is used for their guests. Cortona is just a short 8km drive away as is Camucia and the mainline Rome-Florence-Milan train station. Nearest airports are Perugia 45 mins, Florence 1hr 20 mins, Rome 2hrs.